This is the final preschool lesson in a 3-part series on The Birth of Christ. It is designed to teach preschooler about the Christmas Story based on the details of the Wise Mens’ visit to see the Jesus. 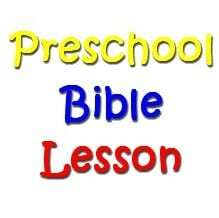 It could be used in any setting with children age 2-5 at church, including a preschool Sunday School class or a preschool children’s church class. As always, consider your own ministry context and modify it as needed. Please leave any feedback or suggestions for improvement in the comment box at the bottom of this page. Learning Objectives: After this lesson, the children will demonstrate an understanding of the wise men’s visit by acting out the story. Use the “Christmas Songs” (extra print out) to lead the children to sing before the Bible lesson. Read Matthew 2:1-12 (NIRV) aloud to the children. There is also a book that you can print out that has the story along with simple pictures to help the children understand what is being read. 1 Jesus was born in Bethlehem in Judea. This happened while Herod was king of Judea. 3 When King Herod heard about it, he was very upset. Everyone in Jerusalem was troubled too. 4 So Herod called together all the chief priests of the people. He also called the teachers of the law. He asked them where the Christ was going to be born. 9 After the Wise Men had listened to the king, they went on their way. The star they had seen when they were in the east went ahead of them. It finally stopped over the place where the child was. 10 When they saw the star, they were filled with joy. Let the children wrap their stars, put them in their decorated bag. Have the children take turns drawing pictures of their gifts for Jesus. Ask the children what their gift would be and write that, with their name, next to their drawing. Evaluation: Have the children (as a class) retell the story of the shepherds’ visit in their own words. Prompt them if they get stuck on a part.